Lightroom 3 on a Mac. The Keymote application installed on the iPhone. A WiFi connection between the Mac and the iPhone. Install Keyboard Tamer and define 16 keyboard shortcuts for the sliders that you wish to control. Add the 16 keyboard shortcuts to the keyset and name them according to their function (e.g. Blacks +5). On the Mac download and run the Keymote receiver. On the iPhone, go to Keymote’s settings and setup a new connection with your Mac. 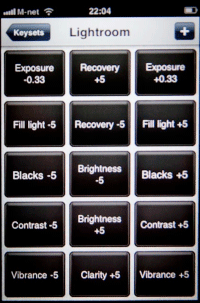 Congratulations – you are now ready to control Lightroom’s development sliders with the iPhone!!!! This entry was posted in Keyboard Tamer. Bookmark the permalink. Hi… Interested in the KeyMote iPhone App, Keyboard Tamer and Lightroom3. I have a MacPro which does NOT have a WiFi card… but it IS hard wired to my ISP/TV box that provides WiFi for my iPhone. Would the iPhone be able to see the MacPro…. Somehow I think not… but just asking. Yes, that’d work. They both need to be on the same network, that’s all. I was wondering how I can download the keyset for for KeyMote that is displayed above? I can not seem to find it when searching KeyMote. You need to create your own key set based on you needs. Keymote isn’t our application, so it doesn’t come with any keysets for Keyboard Tamer. This really works great and is a huge help. It’s just missing one important and much used control – temperature and tint. All of the other sliders would be nice to have but are secondary.